‘999’ Call taken by Whitehaven police from a mobile phone on Greta Gable. 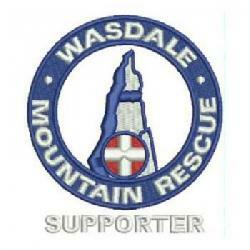 Male walker slipped and fell whilst descending the mountain. He sustained a head injury which was later described as relatively minor bur reported as bleeding heavily. The man had struggled back down the mountain but was now at his tent on Styhead pass. A Sea King helicopter was requested due to the nature of his injury. The helicopter, Rescue 177 from RN Gannett in Prestwick, dropped off the Winchman on scene. The team were making their way quickly up the mountain with two team doctors ready to be airlifted from Gavel Neese. In the event the helicopter carried out the lift at 10.00 p.m. with no further requirement from the team. The 18 team members on the fell were recalled. Weather conditions were mild with a light northwesterly wind. Cloud base was at around 1,800 feet. Dry conditions underfoot although earlier that day there had been heavy rain. Incident was closed at 11.00 p.m.